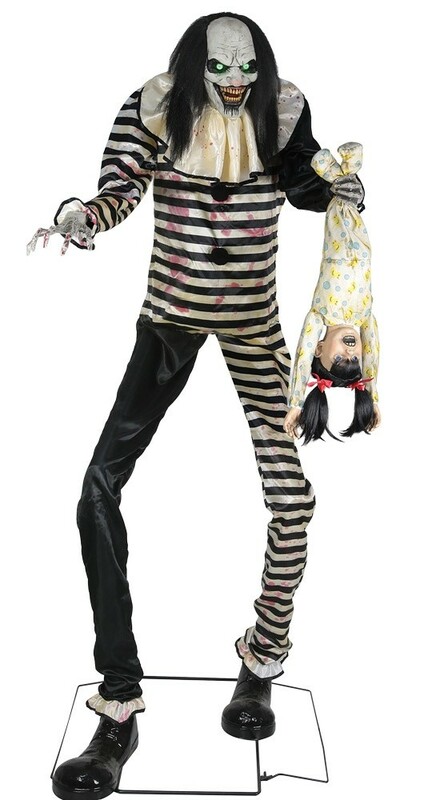 The towering Sweet Dreams Clown just loves laughing and playing with kids! 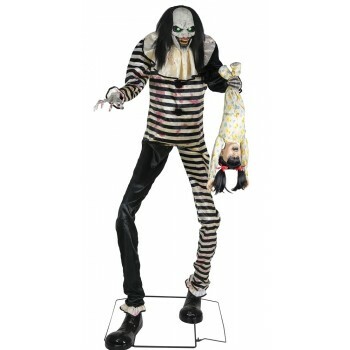 This intimidating 7-foot tall animated towering creep features an easy-to-assemble metal frame, long black hair, a black & white striped costume, and large black clown shoes. He has two creepy elongated hands, one of which is holding a small child by the feet! The Sweet Dreams Clown's eyes will glow with otherworldly glee and his head and torso turns side-to-side while he says one of 3 terrifying sayings as the child he's holding by the feet screams and flails about! Plug the UL power adapter into any standard outlet and choose from Steady-On, Infra-Red Sensor, or Step Here Pad (included) activation options to operate. The infra-red sensor works up to 6.5 feet away and works in all lighting conditions - bright light to no light! Item includes volume control. Easy-to-assemble with quick-connect poles. Assembly is required. Materials: 40% Iron, 8% PVC, 2% Electronic, 30% Polyester, 20% Cotton. For indoor or covered-porch use only. This clown might be available for your next birthday party - whether you want him or not!